The customer acknowledges that he/she has read and accepted without reservation the present sales conditions before confirming the order. Validation of the order implies the acceptance of the general sales conditions. All online purchases are payable at the time of ordering. The minimum required order is 20,00 € before adding Post & Packing / Carriage costs. A non-negotiable 2,00 € flat rate charge for administrative costs is automatically added to the amount payable for every order. The goods ordered remain the property of PJ Production until full payment has been received. Customer’s payment must reach PJ Production within a maximum period of 7 working days following the date of validation of the order. Beyond that period, the order will be cancelled. If the customer’s payment reaches PJ Production after the 7 days period, we undertake to reimburse the amount of the purchase within 7 days of the payment reaching our account. The reimbursement method will be PJ Production choice and we reserve the right to deduct a sum equal to a minimum 10% of the order amount to cover administrative costs with a maximum of 25 Euros per reimbursement. 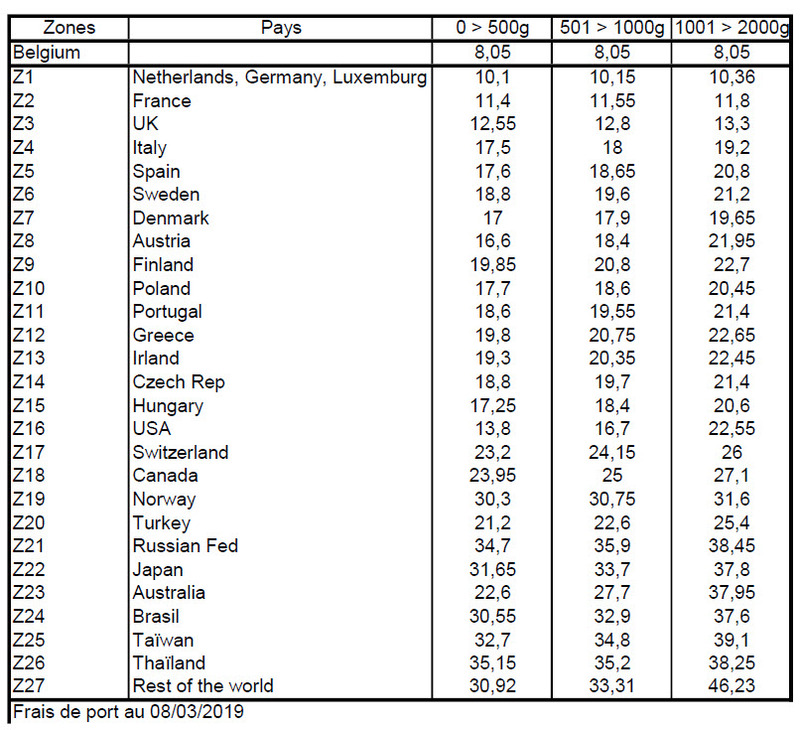 Goods are sent via Belgian Post (bpost) whose prices are outlined below. Carriage costs are calculated per country or region and are non-negotiable. They are subject to change at any time without prior notice. Customs taxes, surcharges and other added values are payable by the customer independently of the carriage costs. Goods travel at the customer’s own risk. Reminder (§2) : A non-negotiable 2,00 € flat rate charge for administrative costs is automatically added to the amount payable for every order..
Orders are dealt with and sent within the most reasonable span of time possible after payment has been received. Customers will be informed as soon as possible if a dispatching delay occurs. Possible delivery delays as outlined on our website are strictly indicative and do not constitute a binding agreement. Parcels are sent to the address given at the time of ordering and travel at the customer’s own risk. PJ Production cannot be held responsible for mistakes, delays, loss, theft or damage incurred during transport or for erroneous information given when ordering. In case of compensation (see dispatching options), indemnity will be limited to the amounts granted by bpost to the exclusion of all other indemnities. Vacation period in 2016: from 21/07 to 15/08/2016 included. Orders placed during this period will be processed upon the resumption of activities. Belgian Law of 6th April 2010 relating to business practices, consumer information and protection allows consumers to cancel their order within 14 working days of receipt of the goods. Goods must be returned within the same time span in their original packaging, undamaged with all the accessories and user manual as well as a copy of the invoice / delivery note to PJ Production, rue Albert Bodson 38, 6280 Gerpinnes, Belgique / Belgium. Within 30 days following acceptance of the return of the goods, PJ Production undertakes to reimburse the eventual payment with the exception of the carriage costs. Expenses related to the return of the goods including possible Customs charges, surcharges or other added values remain entirely the customer’s responsibility. Incomplete goods, damaged goods or goods dirtied by the customer will not be reimbursed in which case the customer retains the right to claim that the goods be returned to him/her at his/her own expense. We reserve the right to cancel any contract agreed by ourselves and without indemnity if, following a case of force majeure, we are unable to deliver the goods. By case of force majeure, we consider above and beyond accepted events (such as strike action, fire, flooding, danger of war …) a ban to import or export, limits on imports and exports, accidental stoppages in production, lack of workforce, manufacturing supplies or means of transport. The above list is not limitative but simply indicative. In the circumstances outlined above, we might also opt for a readjustment of the basic cost on the basis of documentary evidence which we will be able to produce. Our sales are exclusively governed by our general conditions and Belgian Law without a particular derogation written and agreed by us. In case of defects attributed to PJ Production, our responsibility is limited to the replacement of defective parts. No labour costs, commercial prejudice or other damages can be attributed to us. All litigation is subject to the competence of the Belgian Courts and in particular to the competence of the Charleroi administrative region.